In pulverized coal injection systems used by the iron and steel industry, a bag filter separates pulverized coal from hot air. The pulverized coal is then conveyed to a storage tank and the hot air is discharged to the atmosphere. 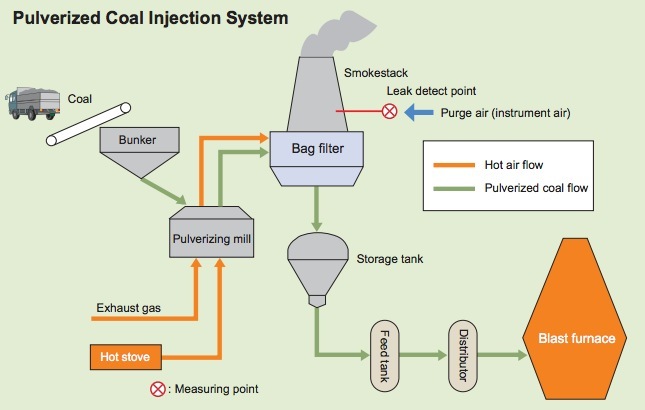 If the bag filter breaks, pulverized coal leaks out into the atmosphere. 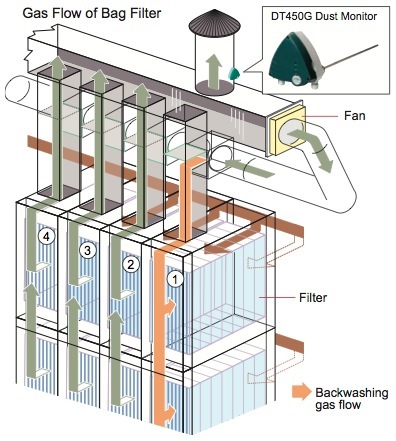 In order to prevent air pollution, bag filter leaks must be detected quickly. Designed for this purpose, the DT450G Dust Monitor is easy to install and requires minimal maintenance. Trend data shows that there is a correlation between the dust amount and the output of the dust monitor. The DT450G Dust Monitor operated for more than two months without maintenance. The microprocessor-based DT450G Dust Monitor features improved operational performance and reliability. Features include one-touch automatic range setup in response to process conditions and automatic drift compensation. Also, the DT450G can measure at a process temperature of up to 250°C, allowing it to cover a wide range of applications. 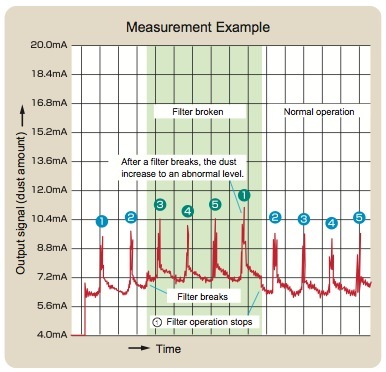 Data collected by the dust monitor helps detect bag breaks, and the data collected at backwashing helps identify which compartment bag filter is broken. Reduced maintenance workload and proper replacement of facilities bring cost savings.